Trina Liang-Lin is Managing Director at Templebridge Investments and Past President of the Singapore Committee for UN Women. She is a pioneer and specialist in the Asian bond market securities sector. She has held senior positions in a number of global investment banks and has worked in Hong Kong, New York, London and Singapore. 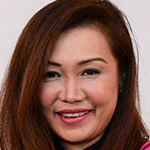 Ms Liang-Lin holds a Masters degree in Finance and Accounting from the London School of Economics and a Bachelors degree in Economics from the National University of Singapore. Under her watch at the Singapore Committee for UN Women and together with her team, two important and significant advocacy milestones were reached with the Singapore government in 2012: first, a mandatory rest day for Foreign Domestic Workers commenced from January 2013; and a National Plan for Action against Trafficking in Persons (TIP) which UN Women contributed to putting in place, guided Singapore’s TIP strategy from 2012-2015, when Singapore got its first standalone anti-trafficking legislation. She is also the co-founder of Project Inspire, a global social enterprise competition for youth. She is past president of FWAS and sits or has sat on numerous and diverse boards including the Sentosa Development Corporation (audit committee), the Community Foundation of Singapore, National Volunteer and Philanthropy Centre (NVPC) board of directors, the Singapore Council of Women’s Organisations (SCWO), THE Victoria Advisory Committee (VAC – comprising Victoria School and Victoria Junior College), the Singapore Repertory Theatre (SRT), the Singapore Institute of International Affairs (SIIA), the Economics and Employment committee of the Singapore government’s feedback unit, REACH, and is the co-chair of BoardAgender. She is a member of the Singapore Institute of Directors. She has been a Young Women’s Leadership Connection (YWLC) mentor since 2014. She is a sought-after speaker and panellist and regularly opines one women’s issues in the local press. In particular, her 2015 opinion article in the Straits Times continues to spark lively interest and discussion. In 2015 for the Singapore General Elections, Ms Liang-Lin was part of PAP candidate Minister Lawrence Wong’s close-knit campaign and communications strategy team. In 2011 she was one of 10 individuals chosen to speak at a rally in support for Presidential candidate and now President Tony Tan of the Republic of Singapore.